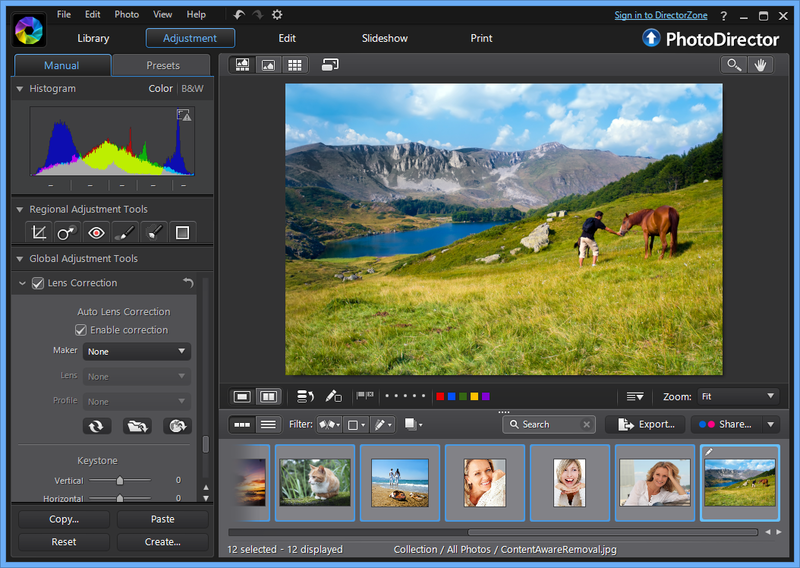 PhotoDirector 5 is a capable tool for organising, editing and sharing your digital images. The "Edit" tab then ramps up the creative possibilities with a range of more powerful tools. The People Beautifier provides options to whiten teeth, remove wrinkles, perhaps reshape your subjects for a more slimline look. The program can remove unwanted objects from pictures, automatically filling in the background. There are some simple effects, frames, a watermarking tool, and more. 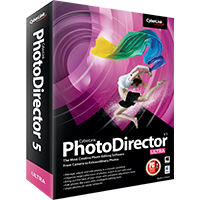 PhotoDirector 5 extends all this with a new Lens Correction tool. If a photo is distorted, this can read its metadata, choose the appropriate lens profile and correct the image automatically. There are only 60 profiles built in, but you can download others from CyberLink's DirectorZone, if necessary. Smarter noise reduction is another adjustment highlight, with the program now better able to remove noise automatically, as well as restoring textural detail which might otherwise be lost. And the new Tone Curves allow you to adjust the contrast of the photo by individual colour channels. Photo organisation has been improved with the introduction of Stacks. These allow you to group together sets of images within a folder: the photos you took on a particular day, perhaps. If you have 500 photos in a folder then this will help cut down your scrolling, and make it easier to find the shots you need, yet the photos themselves remain in the same folder for easy management elsewhere. Elsewhere, there's new support for HDR bracketing (merge up to 5 shots into one HDR image) and split toning (apply one colour tone to the highlights, another to the shadows). And there are a range of smaller, more general additions which should appeal to everyone. Native 64-bit support; 2K and 4K HD video slideshows; an optimised JPEG and RAW decoder (RAW images are now imported up to 3 times faster than before); even a new Windows 8 app, PhotoDirector Mobile, which allows you to take photos and edit them right away. We're not talking about revolutionary change here, then, but there's still plenty to enjoy, particularly the lens correction. If you're an existing user, or just looking for a powerful but user-friendly tool for managing and editing your photo collection, PhotoDirector 5 is worth a look. Please note that the Windows trial version here will download a 1MB CyberLink downloader stub, which will then proceed to download the main application from the CyberLink servers. The trial version here is Windows only. Both Mac and Windows will receive a full build after purchase. Note that the trial version here is Windows only. Mac and Windows will receive a full build after purchase.